It’s true—there really is a right way to pack your vehicle for a long journey. 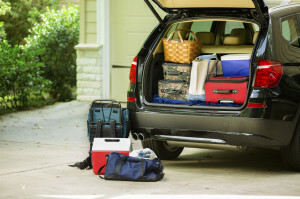 Whether you’re going on a road trip, attempting to transport everything last thing to school or shuttling a load of your most precious belongings for the big move, follow this step-by-step process to make the best and safest use of your time and space. For a fresh start, clear everything from your vehicle. Vacuum and wash it thoroughly (or pay someone else to do that part for you). Only replace the items you’ll need for your trip. Schedule an oil change and tune up, if necessary. Make sure all tires are inflated to the PSI recommended on your doorjamb, not on the tire itself. Don’t forget a spare, and double-check that it’s accompanied by all necessary flat-changing tools. Review and re-stock the first aid and road emergency kits, and make sure the glove box holds your current insurance, registration and any roadside emergency program information. Consider stashing some cash, for tolls and emergencies, and a good old reliable physical map, for GPS backup and general road trip route-dreaming. Pack your largest, heaviest items first, keeping them low and central in the vehicle. Next, fill in remaining space with smaller, lighter items. If you’re packing for a move, try using vacuum storage or garbage bags, which make full use of even the most oddly shaped spaces, and small, easily tuck-able storage bins for breakables. Leave a clear view of the rear window, and make sure items packed on top are secure enough that they won’t come loose in the event of a sudden stop. The last things packed should be the first things you’ll need to access, such as a well stocked cooler; plates, outdoor playthings and other picnic essentials; and overnight bags—one for each traveler, or perhaps a streamlined communal overnight duffle. A few things you might want to have within reach up front include a snack arsenal, a quick clean-up kit and garbage bin, trip activity packs for the kids, recorded books or music, and road games. If you have more stuff than space, need to transport bulky bikes or other equipment, or would simply appreciate the extra breathing room in the car, consider investing in a roof rack or car-back carrier. Look for waterproof, UV-resistant options that are easy to attach and get in and out of, and don’t block access to your vehicle. All packed up, but still have stuff without a home? Stow outdoor gear, extra boxes and more at EZ Storage. Contact us for affordable storage solutions, both short- and long-term.